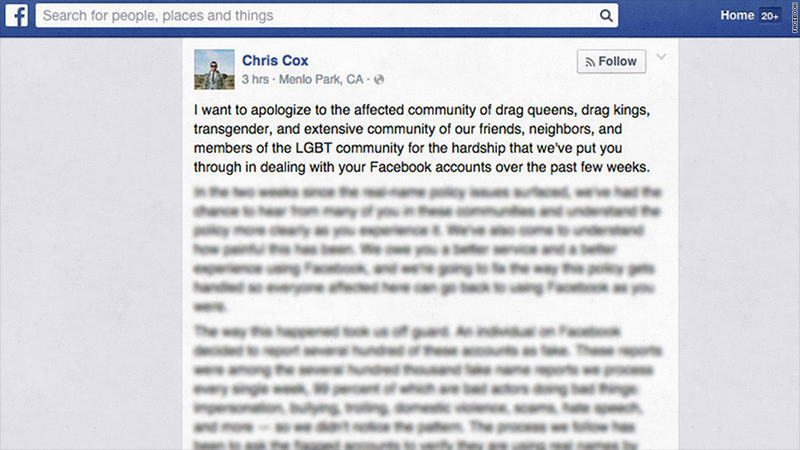 Facebook's chief product officer Chris Cox issued an apology on Wednesday. Facebook issued an apology for its "real name" policy -- and announced that it will loosen restrictions for the drag community. Last month, Facebook made headlines for suspending the accounts of several gay and transgender entertainers because their accounts weren't in the holders "real" names. The LGBT community started jumping ship and signing up for Ello, which doesn't have such a policy. Wednesday's announcement came in the form of a Facebook (FB) post (what else?) from chief product officer Chris Cox's Facebook (and has since been "liked" by CEO Mark Zuckerberg). But it isn't clear exactly how the policy will change to better respect users' rights. According to Cox, Facebook processes thousands of fake name reports every week -- and 99% of these are "bad actors doing bad things." But, recently, an "individual" reported several hundred "fake" accounts and Facebook didn't "notice the pattern," according to Cox's post. In turn, Facebook suspended the accounts and required flagged account holders to submit identification (gym membership, library card or piece of mail) to validate their identity (which is the company's standard protocol). Related: Does Ello have what it takes to be the anti-Facebook? San Francisco drag queen Sister Roma was one of the Facebook users whose account was temporarily suspended. She was particularly vocal about her opposition to the policy and led the use of the viral hashtag #MyNameIs. "Until recently, [the policy has] done a good job of creating a safe community without inadvertently harming groups like what happened here," wrote Cox. The real name policy isn't new -- it's existed for ten years and serves to ensure that Facebookers use names authentic to their real lives. But this instance seems to have made Facebook realize it needs to fix the policy. Cox writes that they're currently building a better system to work to authenticate the identity of the "Sister Romas of the world."